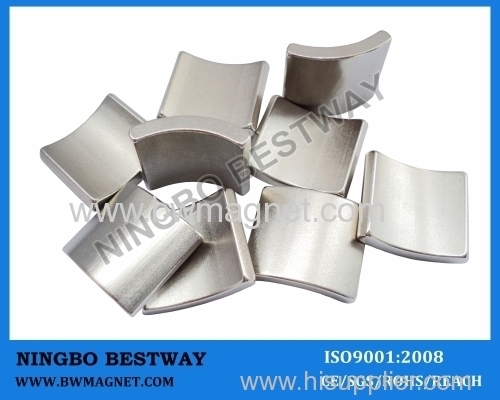 It is one special shape of Rare earth magnets and permanent magnets. It is always manufactured via Wire Cutting and grinding etc. 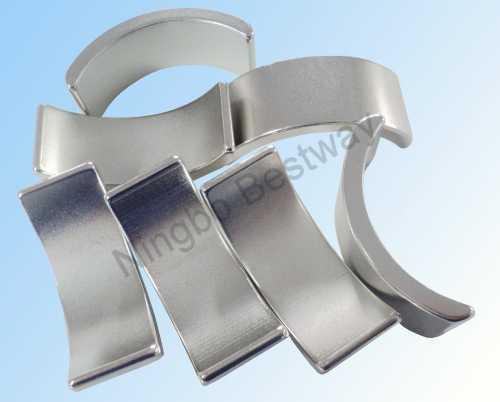 Regular Arc magnets or Segment magnets have the following important factors such as, Outer Diameter or Outer Radius, Inner Diameter or Inner Radius, Degree of Angle, Thickness, Length, Round Edge etc. Motors, eg. voice coil motor (VCM),step motor, geared down motor, etc. 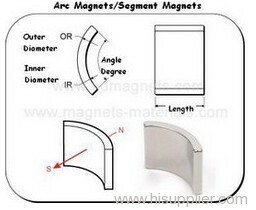 Generally speaking, Arc Magnets are all made as Customer Design and as Special requirement. Our factory production and manufacture magnets according to customer's design on shape, dimension, grades, coatings etc. Magnets grade: From N35 to N50, from N Series to UH Series. Magnetism direction: Mostly magnetized via diameter, if special magnetism direction, please show on the drawing in advance. Magnets coating: Nickel, Zn, Black Epoxy, Black Nickel ,Nickel -Cu-Nickel,Ag, Au etc. Quantities: More mass order quantities. More lower the prices. Original manufacture. For more informations about above magnetism requirement, please visit our website . 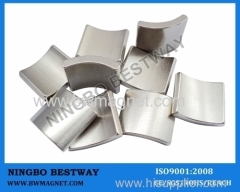 Ningbo Bestway Magnet Co., Ltd. is located in Ningbo, China, and was established in 2000. 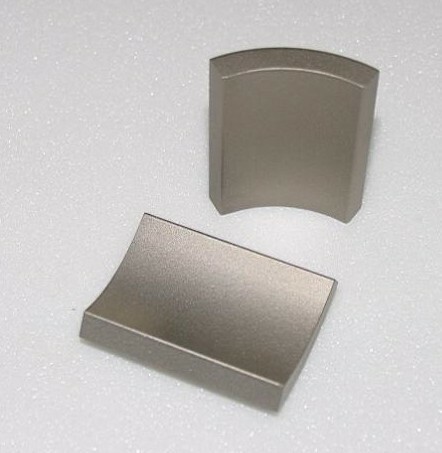 We manufacture various of magnets. We specialize in: magnet balls (Neocubes), sintered NdFeB magnets, bonded NdFeB magnets, alnico magnets, SmCo magnets, ferrite magnets, rubber magnets, and some magnetic machinery. For the magnet ball, we are proud of obtain the CE Certificate. We can produce it according to customers' requests. Tolerance: +/-0.02mm, +0.03/-0.01vmmGrade: N35, N38, N40, N42, N45 and so on. Coating: nickel, black nickel, silver, gold, blue, and red. Electric motors: permanent motors, mini (libration) motors, electric bicycle motors. Electronics: speakers, telecommunications, computer optical drives, OA equipments, Home appliances, meters. Industry: magnetic separators (for food, mineral, glass and coal), magnetic cranes, salvage machineries, magnetic chucks. Civil: magnetic jewelries, toys, magnetic buttons. Medical: magnetic therapy, nuclear magnetism resonance, homeopathic health care. Every aspect of our operation rests upon one service principle: "Bestway is your best choice for magnets." We sincerely welcome your business, and look forward to good cooperation.